So, something new under the sun. It’s a sign, perhaps, of Bowie maturing and starting to consider the world beyond his own, or, more cynically, it’s an indication that Bowie’s imaginative reserves were being depleted and he was increasingly forced to live off the land. Still, “Repetition” is far from didactic—its condemnation comes via Bowie coldly narrating the actions of its main character, Johnny, a failed businessman, a sociopathic bully who beats his wife and who’s convinced that another, better life was open to him. Johnny feels trapped and his victims in turn have no escape from him, so his song is a piece of confinement, of ceaseless, back-and-forth limited movement, like a man pacing in a room. “Repetition” is a series of verses that are built on constant shifts between A and B major, every other bar. George Murray plays the same two-note bassline throughout, also moving between A and B, while Dennis Davis’ kick drum thumps on every beat except in the interim bars between verses (Simon House’s violin is dubbed in one gap, but for the most part, the breaks are similar to the verses). A key change to A minor after the last verse only further dims things. Bowie’s vocal is often detached (he tends to hold on one note for long phrases (“and he looks straight through you when you” is all on E, “ask him how the kids are” is all on F, etc. )), complementing the lyric’s cold observation. The verse’s rhythm is exact: a short phrase on the B major bar (“cause the,” “and he’s“, “I guess the” etc. ), a longer one on the A (“Chevy’s really old,” “bigger than her,” “bruises won’t show“). Yet there’s nuance despite this set pattern. Take the slightly mocking way Bowie sings “blue silk blouse,” a descending trio of notes, which suggests how minor and pathetic Johnny’s fantasies truly are, or the growing tension in Bowie’s voice as the verses go on. The only time Bowie breaks his narration is a near-spoken “don’t hit her,” which seems like a long-delayed response to Lou Reed’s deadpan “you better hit her” in the VU’s “There She Goes Again.” The line appears in the space between Johnny arriving home to find the food cold, and the off-stage beatings: it’s an aside, buried in the mix, and there’s no anger in Bowie’s voice, just resignation and empty disgust. Recorded September 1978 in Mountain Studios, Montreux, Switzerland, and March 1979 at Record Plant Studios, NYC. A version was recorded in New York for Radio One’s ChangesNowBowie (a retrospective pegged to Bowie’s 50th birthday) in January 1997, with the then-standard crew of Mike Garson, Reeves Gabrels, Gail Ann Dorsey and Zachary Alford. Also performed live in 1999 (one set was taped by the BBC on 25 October 1999). Essential cover: The Au Pairs, 1981. * The lone exception I can think of is the dreadful “God Knows I’m Good,” off Space Oddity. ** There’s a bit of black humor to its sequencing, as “Repetition” directly follows “Boys Keep Swinging,” giving that title another, gruesome meaning. 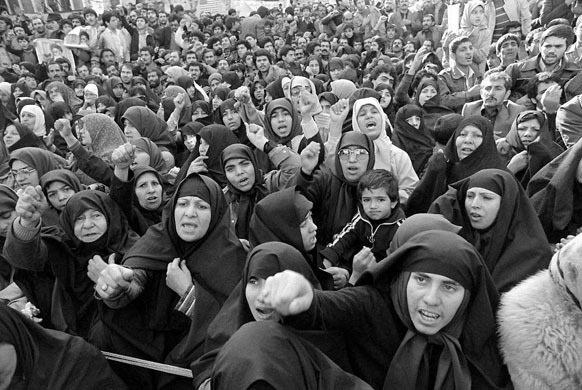 Top: “Iranian Women Shouting at US Embassy,” Tehran, 21 November 1979.